Technology Interactions, based on the 20 most popular technology education lab modules, provides opportunities for students to learn and apply technology principles to the solution of real-life problems. Using Technology Interactions, students will gain understanding of the principles behind the National Standards for Technological Literacy. 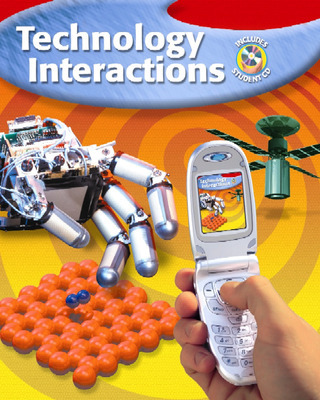 This edition of Technology Interactions reflects the most popular modules currently used in schools. Three brand new modules are included: Materials Science, Energy and Power Technologies, and Forensics. The other modules have been updated and reorganized. Math Link, Science Link, Reading Link, and Writing Link in every chapter connect academics to technology education for students. Students will practice and apply academic skills as they gain technology literacy. A Student CD, packaged inside the back cover of the Student Edition, offers students interactive labs that reinforce and extend textbook concepts. Enrichment and Reteaching worksheets are also included.